Containers are the much forgotten commodity for primitive living. Think about if you had no bags, no boxes, no tupperware, ziploc baggies, foil, jars or anything to gather and store food and other necessary items in. You need to make a lot of containers and bags! One great tool is rawhide. Rawhide is the hide of animal from which the final membrane is not removed nor is it tanned. The hide remains stiff- or will return to being stiff after it gets wet. 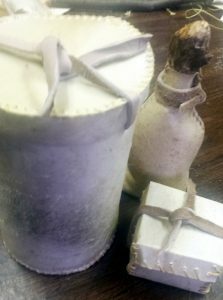 Rawhide is great for containers – unless it’s a particularly humid. It can also be used to make drums, rattles and other needed items. 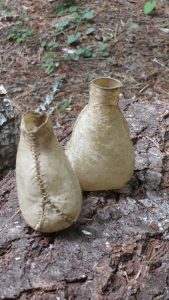 Several types of rawhide containers. 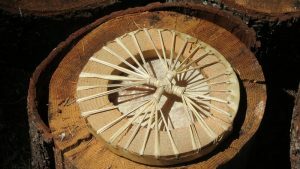 Small rawhide drum with wood frame.